The white-breasted woodswallow (Artamus leucoryn) belongs to the family of currawongs, butcherbirds and woodswallows, Artamidae. The white-breasted woodswallow species are distributed in India (Andaman Islands), Malaysia, Indonesia, Philippines, Papua New Guinea, Timor-Leste and Australia. These woodswallow species are insectivorous and catch insects on the wing. These woodswallows are polytypic species. The white-breasted woodswallow (Artamus leucoryn) is a medium-sized woodswallow, measuring 18 to 20 cm in length and weighing 35 to 50 grams. The white-breasted woodswallow species have dark slate-gray or brownish gray upperparts and wings. The head, chin, throat are dark gray. The lore region is darker. The rump is whitish. The tail is dark gray. The underparts are whitish. The bill is pale blue with dark tip. The irises are blackish. The feet are gray. In juveniles, the throat and breast are grayish and the upperparts are browner. Their call is a rasping "wek..wek..wek..wek" sound. 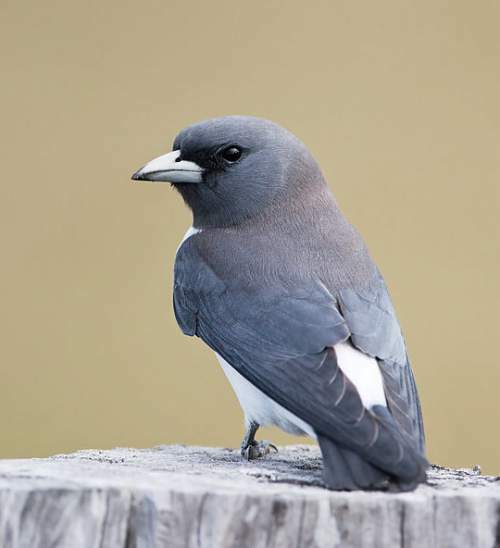 These white-breasted woodswallow species are distributed in India (Andaman Islands), Myanmar (Coco Islands), Malaysia, Brunei, Indonesia, Philippines, Papua New Guinea, Timor-Leste, Vanuatu, New Caledonia (France) and Australia. 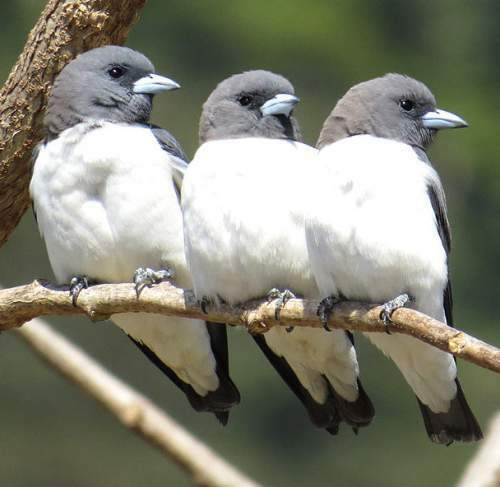 In India, these woodswallow species are distributed in North Andaman, Middle Andaman and South Andaman Islands. The white-breasted woodswallow nominate subspecies A. l. leucoryn is distributed in Philippines, Natuna Islands (Indonesia), Sulu Archipelago (Philippines) and Borneo (Malaysia, Brunei and Indonesia). The white-breasted woodswallow subspecies A. l. humei is distributed in Coco Islands (Myanmar) and Andaman Islands (India). The subspecies A. l. melaleucus is distributed in the French territory of New Caledonia. The white-breasted woodswallow subspecies A. l. tenuis is distributed in Vanuatu and Banks Islands. The subspecies A. l. amydrus is distributed in west Peninsular Malaysia and Indonesia (Sumatra, Java, Bali and Bangka Island). The white-breasted woodswallow subspecies A. l. leucopygialis is distributed in Australia, Maluku Islands (Indonesia) and New Guinea. The subspecies A. l. pelewensis is distributed in Palau Island and western Micronesia. The subspecies A. l. musschenbroeki is distributed in Babar and Tanimbar Islands (Indonesia). The subspecies A. l. albiventer is distributed in Indonesia (Sulawesi and Lesser Sundas). These white-breasted woodswallow species have low forest dependence. These species normally occur in altitudes from 0 to 2000 meters. The artificial ecosystems and habitats of these woodswallow species include agricultural fields, plantations, canals, rural gardens, urban parks and degraded tropical and subtropical forests. 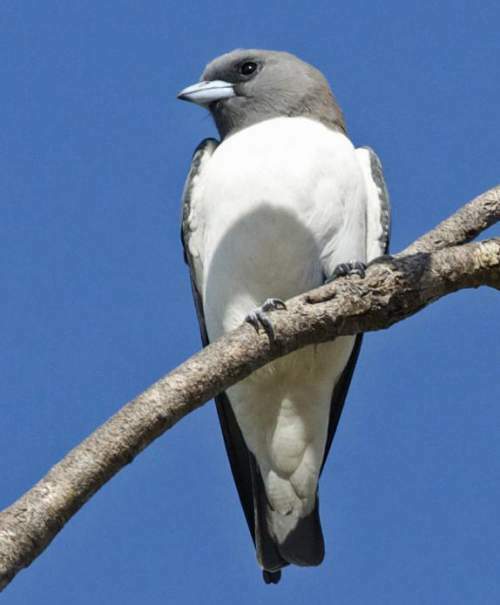 The natural ecosystems of these white-breasted woodswallow species include tropical and subtropical moist lowland forests, tropical and subtropical moist montane forests, mangrove forests, dry grasslands, flooded grasslands, dry savanna, marshes and rivers. The diet of white-breasted woodswallow consists mainly of flying insects. Beetles, cicadas, crickets, grasshoppers, mantids, moths, airborne termites and ants and airborne spiders are their primary food. These white-breasted woodswallow species are arboreal and forage usually above the canopy. They make aerial sorties from conspicuous perches and hawk flying insects. They also form flocks and follow the swarming insects and catch them on the wing. The breeding season of the white-breasted woodswallow species is from March to May in Indonesia (Sumatra). The laying season in Philippines is during March and April. The breeding season is from April to June in Java (Indonesia). These woodswallows are monogamous and are strongly territorial. The breeding pair build a loose, shallow cup-shaped nest on the bare fork of a tree branch or in a hollow of a broken branch. The woodswallow nest is a shallow saucer of interwoven moss, cobwebs, fibres, rootlets and pieces of bark. The typical clutch contains three pale green eggs with brown spotting. Both the parents take turns to incubate the eggs. The white-breasted woodswallow parents feed the young with worms and insects. The nestlings are entirely altricial, being naked and blind, requiring continuous parental care. These white-breasted woodswallow species are non-migratory resident birds. They make local nomadic movements. North to south movements have been observed in Australia. Post breeding, the juvenile white-breasted woodswallows may disperse and establish in new locations within the range. They may make local movements for feeding and breeding within their range. The global population size of the white-breasted woodswallow (Artamus leucoryn) has not been quantified. The overall population trend of these species is reported to be stable. Throughout its range this woodswallow species is reported to be common. The generation length is 5 years. Its distribution size is about 30,000,000 sq.km. Degradation and fragmentation of habitats are the main threats that may endanger the survival of these woodswallow species. The white-breasted woodswallow (Artamus leucoryn) does not approach the thresholds for being Vulnerable under the range size criterion or under the population trend criterion, or under the population size criterion. The CITES (Convention on International Trade in Endangered Species of Wild Fauna and Flora) status is ‘Not Evaluated’ for white-breasted woodswallow (Artamus leucoryn). The white-breasted woodswallow (Artamus leucoryn) is closely related to Fiji woodswallow (Artamus mentalis). The nine recognized subspecies of the white-breasted woodswallow are: A. l. leucoryn, A. l. humei, A. l. melaleucus, A. l. tenuis, A. l. leucopygialis, A. l. musschenbroeki, A. l. albiventer, A. l. amydrus and A. l. pelewensis. Current topic in Birds of India: White-breasted woodswallow - Artamus leucoryn.